Frozen meat never technically goes bad, but long-term storage can negatively impact quality. 2 Can You Freeze Meat Twice? 3 How Long Can Meat Stay out of the Freezer Before You Cook It? 4 Can You Use Stew Meat That Has Been Frozen for a Year? Meat is safe to eat after an indefinite storage time in the freezer. However, the longer meat is frozen, the more deterioration becomes noticeable. 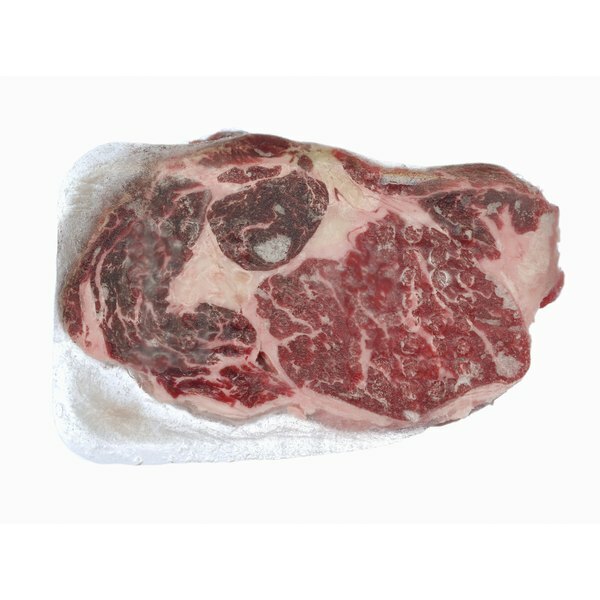 Any meat that is stored constantly at 0 degrees Fahrenheit will be safe; however, you may not want to eat it if it sits too long frozen due to freezer burn, ice formation and a tough texture. When done correctly, freezing meat is a useful way to stretch your dollar and put up some food to have on hand for later use. Meat that is uncooked keeps the longest in the freezer due to its higher moisture content. Freezing food prevents the growth of microorganisms that can cause food-borne illness and spoilage, keeping it safe indefinitely. Store packaging of meat is suitable for short-term storage in the freezer, but if you plan on storing meat for several months or more, take care to cover the original packaging in another layer of freezer-safe packaging to prevent freezer burn. Uncooked meats such as poultry, beef and pork keep well in the freezer with no loss of quality for four to 12 months, depending on the cut. Cooked meat is also safe to freeze for an indefinite amount of time; however, the loss of quality occurs quicker than in uncooked meat. To freeze cooked meats, package them in freezer-safe containers and immediately place in your freezer to rapidly cool and freeze the meat. Rapid cooling prevents the formation of ice crystals that can damage the cells of meat during thawing. Place frozen meats in the back of your refrigerator or in a deep freeze to avoid temperature fluctuations. Freezing foods during their peak of freshness helps to retain the nutrients of the frozen food; be sure to freeze meats when they are completely fresh and not at the end of their usefulness to obtain the best quality. If you plan on freezing meat regularly, consider investing in a vacuum-sealing food storage system to achieve the best results for long-term storage. It is important that you thaw frozen meats properly to prevent food-borne illness. Always thaw meats in the refrigerator, microwave or under running water. These are the only ways that you are able to thaw meats and keep them safe for consumption. Once meat has been properly thawed in the refrigerator, it is safe to refreeze it; however, this will adversely affect the quality. Plan in advance to slowly thaw foods in the refrigerator or place the frozen meat in a sealed plastic bag and immerse it in cold water. Change the water every 30 minutes until the meat is thawed and cook immediately. How Long After Buying a Beef Roast Is It Good to Cook?